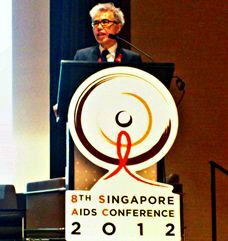 The 8th Singapore AIDS Conference was held on 17 November 2012 at the Mandarin Orchard Hotel. The event, jointly organised by Action for AIDS (Singapore), Tan Tock Seng Hospital and the Health Promotion Board, was attended by over 350 delegates from stake-holding organisations within Singapore and across Asia. George Hwang was invited to be part of the symposium panel for “Biomedical Strategies for Prevention: What are PEP, PrEP and TasP?” and highlighted the Right to Health as outlined under the Universal Declaration of Human Rights. Drawing from his extensive experience in the field of Intellectual Property and Human Rights, he drew attention to several legal barriers in Singapore that impede the HIV-positive individual’s access to appropriate forms of medication and treatment. These include the Medicines Act and the Patents Act. The conference theme “Getting to Zero: Zero New HIV Infections, Zero AIDS-related Deaths, Zero Discrimination” aligns with UNAIDS’ current vision, and underscored an overarching aim to achieve these goals. The six symposiums, exhibitor stands and youth programmes provided opportunities for professionals in the healthcare industries, volunteers, activists, government representatives, academics and foreign representatives to interact and share the latest developments and sentiments towards treating the virus amidst evolving societal concerns. The Guest-of-Honour was Dr Amy Khor, Minister of State for Health. Other highlights of the day included insights from field experts across Asia, including Bangkok, Hong Kong and the Philippines. The day will be remembered as one when Singaporean Avin Tan came out publicly as a person living with HIV. Mr Tan is only the second Singaporean to do so, the first being My Paddy Chew over a decade ago.